Today we’re looking at another tool I’ve recently purcahsed for DIY projects around the house, the Kreg Jig Jr. — the slightly smaller and less expensive cousin to the full Kreg Jig Master System . I saw the ads on TV and had to try it for myself. Both systems are made by Kreg and offer the ability to drill precision pocket holes to join boards. Pocket hole joints make rigid connections between perpendicular boards, well suited to tables, drawers and other framing applications. The Master System more easily mounts for repeated use and can be adjusted to accommodate larger board thicknesses. The Pros: Works just like they say! Simple to use. All measurements are done for you! And everything you need (except a power drill) is included, so you can quickly adjust the jig and make your drills. Works very well with only minimal time looking through the users guide. The Cons: The Kreg Jig Jr. is small and can sometimes be difficult to clamp in place or annoying to unclaim and reclamp between uses — where the master system version would clearly have the advantage. The Review: 4.8/5.0 Works exactly as they say in the ads. It makes it simple to get professional looking joints that hold together tightly. I was able to quickly repair an Ikea dresser drawer that had started to come apart with just a couple simple holes and screws, set precisely to the right angle and depths by the Kreg Jig. Get the professionally finished appearance most do-it-yourself folk strive to achieve–without much real work! Can’t wait to use this for another project! Any suggestions? 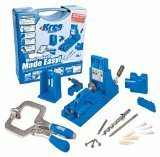 Have you used the Kreg Jig? What did you think? Let’s take a moment to talk about tools you’ll want when you are working on building or woodworking do-it-yourself projects. At only $129 and free shipping on Amazon, it’s a deal thats tough to beat. With 18V interchangeable batteries, you’ll have all the power you’ll need to cut and drill and drive virtually any project you need, with driver/drill, circ saw, sawz-all style reciprocating saw, and flashlight. When selecting tools it’s important to take quality into account. While the cheapest tool may be perfectly fine for one or two projects, a higher quality tool may provide years of service. Be sure to factor how often you plan to use a tool and your expectations of tool longevity into your value calculations on a new tool purpose. For larger or single-project-use tools, consider borrowing from a friend or renting from a local home warehouse.